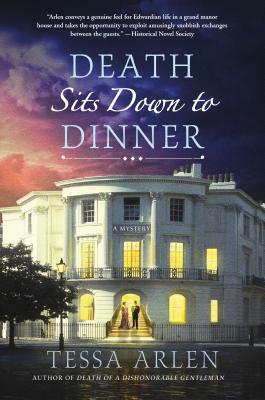 Filled with deceptions both real and imagined, Death Sits Down to Dinner is a delightful Edwardian mystery set in London. Lady Montfort is thrilled to receive an invitation to a dinner party hosted by her close friend Hermione Kingsley, the patroness of England's largest charity. Hermione has pulled together a select gathering to celebrate Winston Churchill's 39th birthday. Some of the oldest families in the country have gathered to toast the dangerously ambitious and utterly charming First Lord of the Admiralty. But when the dinner ends, one of the gentlemen remains seated at the table, head down among the walnut shells littering the cloth and a knife between his ribs. Summoned from Iyntwood, Mrs. Jackson helps her mistress trace the steps of suspects both upstairs and downstairs as Hermione's household prepares to host a highly anticipated charity event. Determined to get to the bottom of things, Lady Montfort and Mrs. Jackson unravel the web of secrecy surrounding the bright whirlwind of London society, investigating the rich, well-connected and seeming do-gooders in a race against time to stop the murderer from striking again.